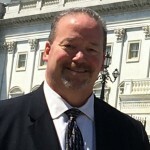 Prior to joining ESA in 2012, Chris Heaton was the executive director of the Texas Municipal Police Association in Austin, TX. He previously served as a law enforcement officer for 20 years including service with the Plano, TX Police Department from 1984 to 2000. Heaton has provided advocacy efforts on public safety issues as a volunteer leader or executive officer, at the state and federal level, for over 23 years of his professional career. Heaton graduated from Stephen F. Austin State University with a degree in Criminal Justice. He also holds a Master of Public Administration degree from the University of North Texas. Heaton recently completed certification in nonprofit management from the Institute for Organization Management.